In an earlier post, we spoke of Mark Smiths rear end, but in this one I'm going to speak about more rear ends. Rear end differentials, to be precise. Do you know your rear ends? I'm asking because if you need a primer, we got it. 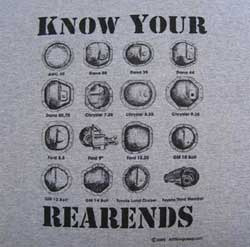 We've been out of our Know Your Rear Ends T-Shirt for a while, just printed a few more up and have now printed the rear end primer on the BACK of the tee, so you can add your rear end to the mix! The tee is just $18 bucks and you and the guy behind you will find it well worth every penny! Enjoy.